Our 6 year old decided that he wanted to be a “big pair of pants” this year for Halloween so we said we would try and this is what we came up with. 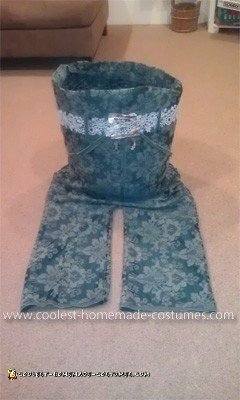 We used material that we had in the house and bought some chicken wire to give the pants some shape. We even decided to add a poem in the pocket which is one of the assignments from their school. Paper for poem in the pocket. 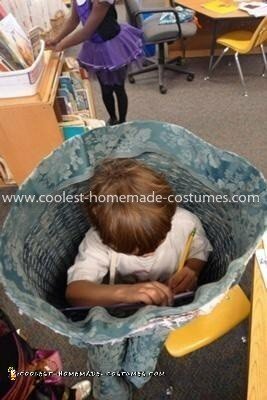 1) Measure chicken wire so it covers from hot child’s waist to just slightly over their head. 2) Shape the chicken wire around the child so that it forms a cage around them. This Should be spacious enough for the child to move around and still be proportional to a pair of pants. 3) Measure and cut the material length to the desired height to include the height of the child and 5-6 inches. 4) Wrap the material around the chicken wire and begin to attach it to the wire to the material with glue and wire attachments or small safety pins. 5) Wrap material over the top of the chicken wire so that material does not fall down. 6) Cut the bottom material to form the leg holes. Cut down the center of the material and stop a few inches below the chicken wire. 11) Glue trim in place. 14) Determine the location of the eye holes and cut holes in the material and in the chicken wire if needed. 15) Write a poem on a piece of paper and fold it so it sticks out of the pocket. 16) Be prepared for numerous compliments and have fun. Our 6 year old was able to handle this costume and had no trouble seeing out of the eye holes. It was comfortable and light weight and he was able to sit don in it as needed. He did need assistance going up and down stairs. 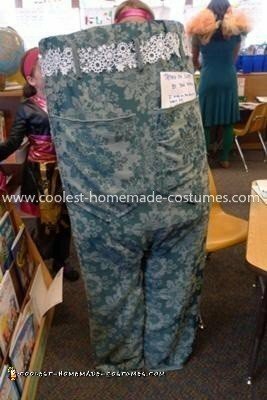 It was the hit of his school costume parade and parents were impressed with its creativity and simplicity. His mother held the candy bag but there was enough space inside the pants for a bag which makes it fun to put candy right into the pants. 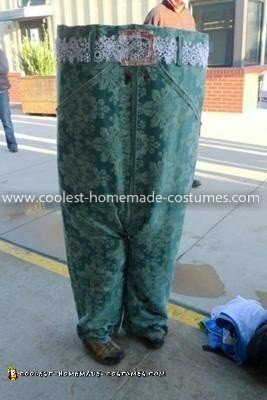 He did report that he received extra candy quite often based on people liking the costume so much. I loved the concept but watching the giant pants walking around in the video really made me laugh out loud! Great job – he must have been thrilled with the final outcome! Thank you! Thank You! THANK YOU!!! When I found this, I knew that this was going to be MY year, although, this should be interesting considering I’m 5’3″.